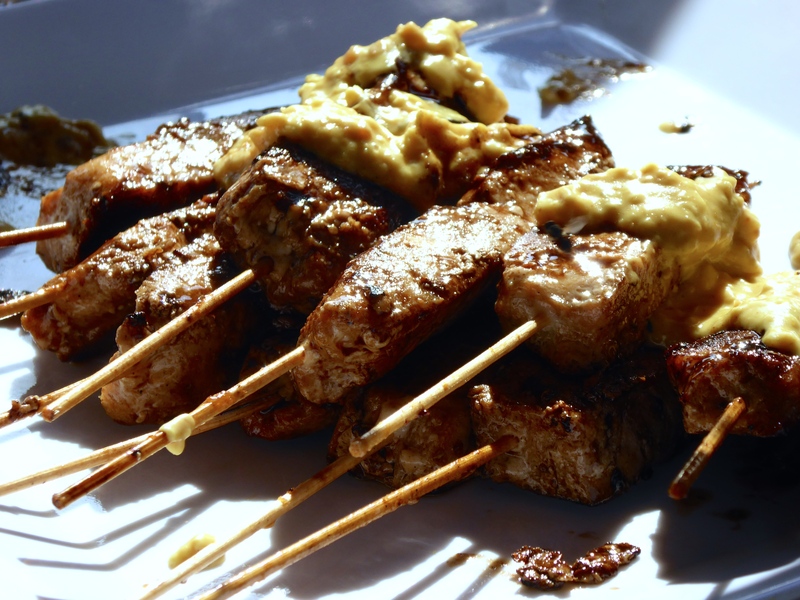 Sate Ikan (Fish Satays) | Gourmet from the galley! We are back in Indonesia for a month and one of the things we really love about Indonesia is the food! We are moored at Pulau Weh, actually we are moored off a smaller island call Pulau Rubiah. The snorkelling here is fantabulous, as is the food! We have discovered a local delicacy called sate gurita (sate octopus). Delicious and tender, it awoke memories of our time with our boys at Gili Air when we sailed there for Christmas 2014. I cooked sate ikan, using some marlin we caught in Australia. It was part of a feast that I cooked up on the boat for a friend who wanted to film it. While anchored off Gili Air (Lombok Indonesia) with our son’s Jedd, Alex, Kye and two of their girlfriends, we had a visit from Jackie and her son Alexander. Jacqui was interested in filming a short video of us cooking up a storm on Thorfinn. I hadn’t had time to think about what to cook and therefore had not shopped in Bali before we left. 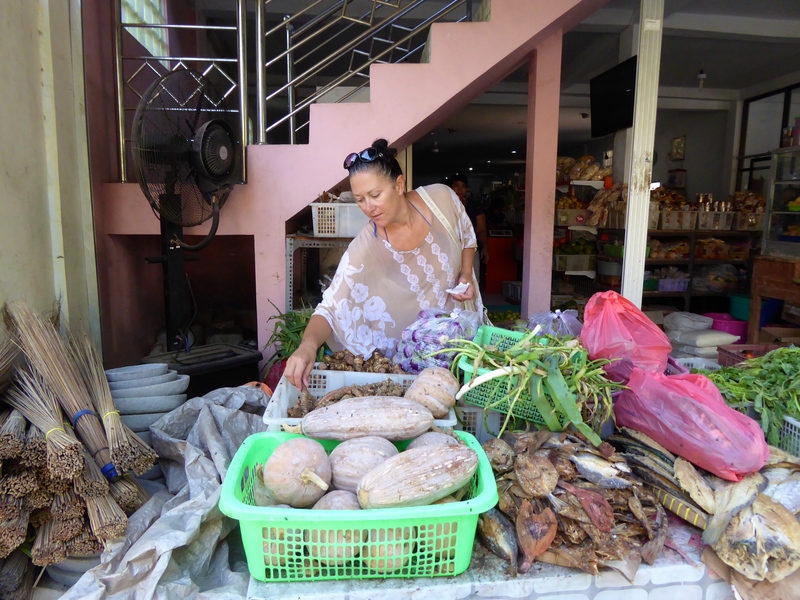 So, before I could decide what to cook, I had to look at what I had on the boat and then I had to go ashore to see what I could purchase on the small island of Gili Air. In the tiny village I found a shop selling some fresh produce and a very limited array of other supermarket goods. I choose some things I love to cook with – limes, ginger, garlic, chillies, galangal – while I gradually formulate an idea of what I would cook. Shopping for chillies, lime, galangal etc. Back on the Thorfinn I fine-tuned my proposed menu. When in Indonesia, do as the Indo’s… I decided to cook some Indonesian favourites. Ikan Bakar (grilled fish), sambal and sate ikan (fish satays). So, while the boys enjoyed the swimming and snorkelling, and the girls chilled out on the sun-beds with a cocktail, Dwayne and I cooked and Jacqui filmed. It was a lot of fun and when it was ready the kids joined us on Thorfinn for a feast. As we sat around Jedd’s surfboard, which had become our makeshift table for the day, we enjoyed the sunset and the company of family and friends… and I think we all privately reflected on how lucky we were. I grated one onion into a sieve over a bowl. Using a spoon I then pressed down on the grated onion to squeeze out the onion juice. I set aside the the grated onion for using in the peanut sauce. I mixed it well, covered and refrigerated it until I was ready to skewer the marlin to grill. Once the peanut butter was well blended I returned to a gentle heat and cooked for about 5 minutes while stirring and checking it often. (Add water if needed). I skewered cubes of marlin onto small skewers and Dwayne cooked them on the BBQ. I then served them with the peanut sauce. 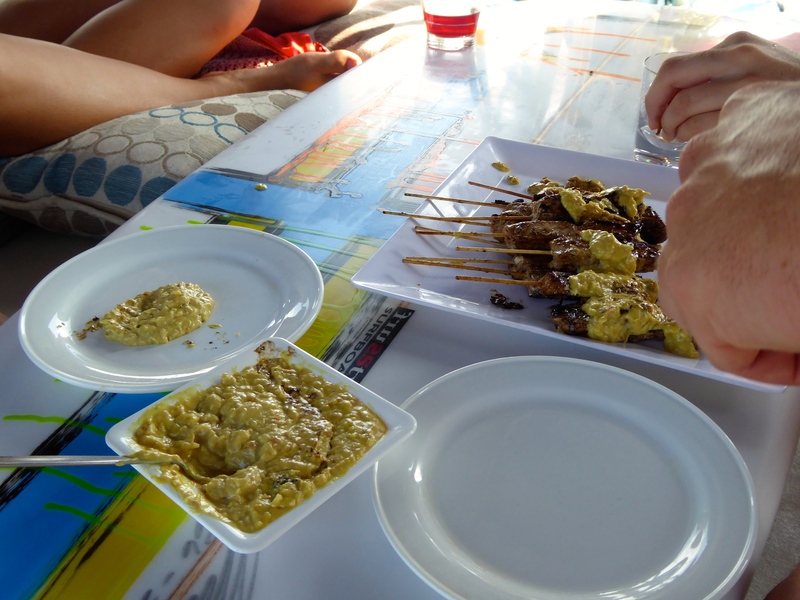 Sate Ikan served with peanut sauce on Jedd’s surfboard! I loved our Christmas on Gili Air!… and have welcomed the opportunity to reminisce about it. Hope you enjoy the recipe. Want to read about catching the marlin? Click on the photo below! Sharing is caring! Why not pin this recipe so you can always find it! That peanut satay sauce is a keeper – thanks Kelly!